By permission of instructor only. Recipient of gift certificate can enter registration code received from teacher or education director. 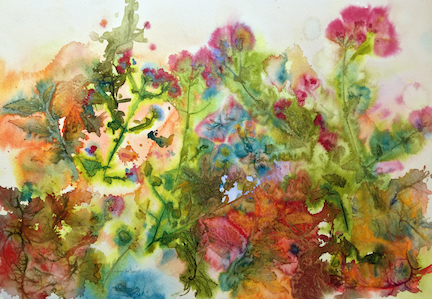 Plant material can enhance and almost paint your painting for you! Join us as we utilize the shapes, textures and patterns of leaves, plant material and natural elements to create paintings that celebrate the beauty of the garden. Leaves. Plants with printable veins, flattened in a book (not phone book, you need them to be weighted, flat). For best results, keep the plants flat in the book until the moment you use them in class. Ferns and grasses, trees and bushes with prominent veining on their back side work beautifully. Also, interesting leaf shapes are lovely even without veining. Bottle of diluted dish detergent or shampoo.